Save The Rhino Trust: the desert adapted black rhino surviving in the remote and arid Kunene Region of north west Namibia are the ONLY rhino world-wide that have survived on communal land with no conservation status. They are in the fullest sense of the word truly wild. No fences. No borders. They live and go where they please. In the early 1980's in this vast, emptily beautiful and spectacular desert scenery a savage slaughter of wildlife was taking place. Colonial officials, South African Defence force personnel, hunters in helicopters, pro-Independence guerrillas - it was a free for all. As rhino populations crashed and extinction loomed a group of people (scientists, tribal leaders, journalists, businessmen, safari operators, farmers) gathered together to form a Trust Fund with the aim of stopping the havoc. And it worked ! 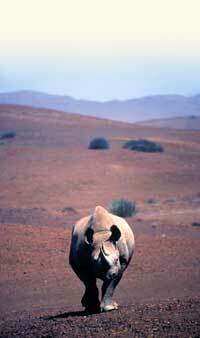 Since Save The Rhino Trust was formed poaching has dramatically decreased and rhino numbers have more than doubled. With the help of local communities, tribal chiefs and headmen, not to mention volunteers and government conservation officials, these magnificent animals are once again roaming the dunes, dry grass rocky plains and spectacular mountains of Kunene - one of the world's last great wilderness areas. The aim of this web site is to introduce the unique desert rhinos, the people who are working to protect them and to invite you to become part of the effort to ensure that this remains a conservation success story. SRT's Logo: Taken from a Khoi San bushman petroglyph - one of many haunting prehistoric images of animals ranging from Skeleton Coast seals to desert elephants carved into the rose red rocks at Twyfelfontein in Kunene. Ensuring that local communities benefit from conservation is essential and SRT has been involved in setting up local crafts centers, developing projects specially designed to involve women in self help income generating schemes, the establishment of local ecotourism, education etc. These are the organisations and individuals that sponsor or give grants to the desert projects of the SRT. His Excellency President Sam Nujoma has taken a direct interest in the desert elephant of the by facilitating the building of water installations that are for the exclusive use of the elephant and other desert wildlife in the Hoanib (dry) River. Thus contributers help to keep the local communities involved in conservation issues on their land. Their support creates a direct link to neighbouring communities and helps us meet the annual costs of protecting and monitoring the rhino and elephant of the desert for future generations. The SRT draws up a budget in of expenditure in agreement with the Donor/Sponsor or Adoptee. These agreed Budgets are audited on an annual basis to ensure that the funds are spent in agreement with the donors who are a vital lifeline for desert wildlife conservation. All Donors automatically become a member of Rhino 2000. The Rhino 2000 donor members list of other donors may be emailed to anyone who wishes to see it. The Save the Rhino Trust offers specialist safaris to see the desert rhino and elephant in conjunction with the Wilderness Safaris, Palmwag Lodge and the Tsisib and Doro Nawas Conservacies near the Ugab River and Brandberg (Duareb) Mountain. The SRT organises Camel Patrol Safaris to see the rhino near Sesfontein and Khowarib.